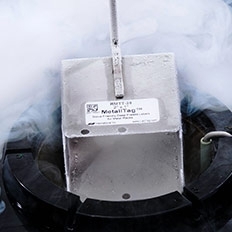 GA International MetaliTAG™ labels are specifically designed for the identification of stainless steel racks, cassettes and other metal containers for cryogenic freezing and liquid nitrogen storage. Made of a durable thermoplastic film, these thermal transfer labels are coated with a glove-friendly adhesive, and adhere firmly to various metal surfaces including aluminum, stainless steel, powder coated metal, painted metal, iron and more. 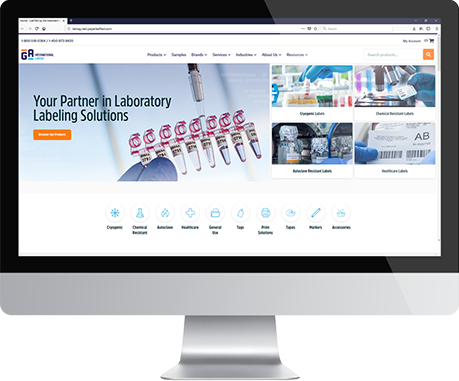 Ideal for quick and easy identification of freezer racks and Dewar canes to be stored in deep-freeze and cryogenic conditions. These labels for metal surfaces can be used on a variety of containers, such as metal racks, aluminum cassettes, X-ray film cassettes, film cans, aluminum vials, aluminum and stainless-steel boxes, sleeves and canes for cryogenic straws, tools, equipment, freezers and freezer rooms, in addition to polycarbonate cryoboxes. Intended for short- and long-term storage in liquid and vapour phase liquid nitrogen (-196ºC), laboratory freezers (-120ºC, -80ºC, -40ºC and -20ºC), freezer chambers, transportation on dry ice and other harsh cryogenic environments. MetaliTAG™ labels are available in an assortment of colours, shapes and sizes, supplied in roll formats (on 1” and 3” cores), compatible with all major brands of thermal transfer barcode printers, including Zebra, CAB, Datamax O’Neil, SATO, Printronix, Citizen and others. They also accept writing with permanent markers such as our cryomarkers. 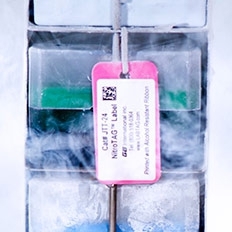 These cryogenic labels for metal racks are resistant to standard gas sterilization (759 mg/L of ethylene oxide gas, 1 hour, at 55°C, and 40-80% relative humidity). Moreover, they can also withstand wiping and rubbing with surface sanitizing wipes (Sani- Wipe™, Eco-Wipe™ and Eco-Wipe™ Duo).